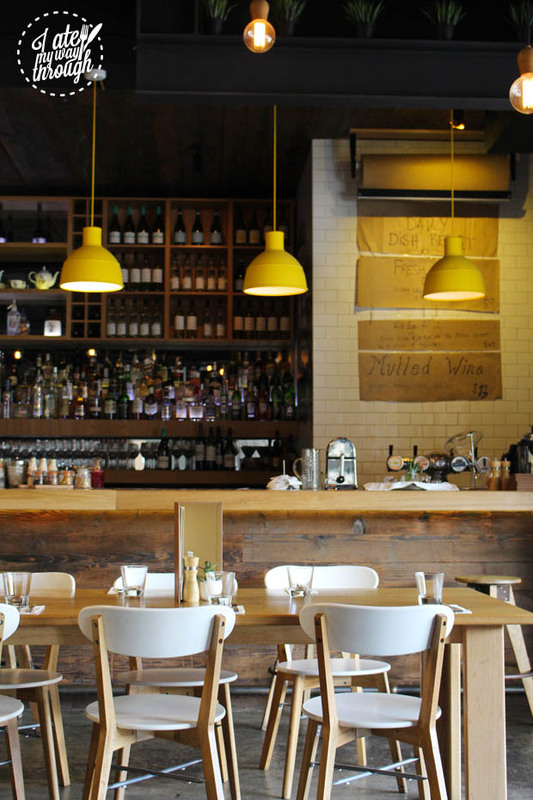 Around Sydney, you tend to be spoiled for choice when it comes to places to dine. In different suburbs, you’re likely to find a certain cuisine or vibe that could be totally different from another area. 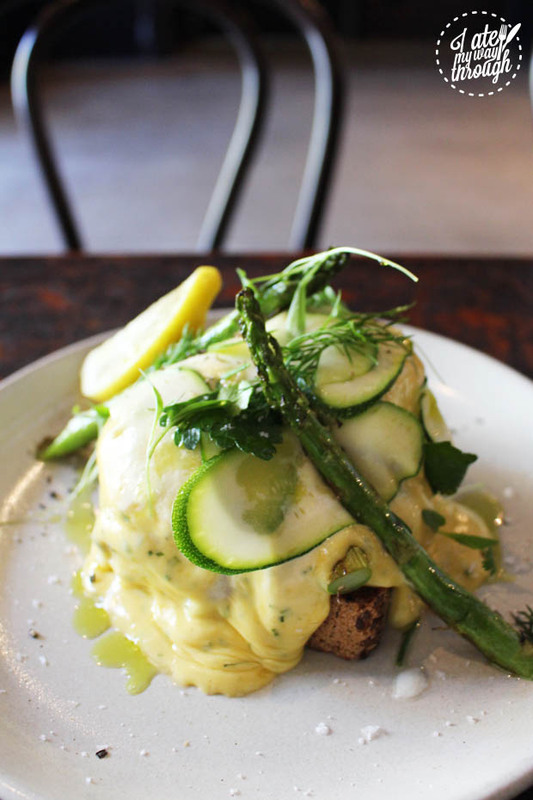 The neighbouring suburbs of Rosebery and Alexandria are fast becoming known as prime locations to snag a decent brunch, worthy of many an Instagram post. 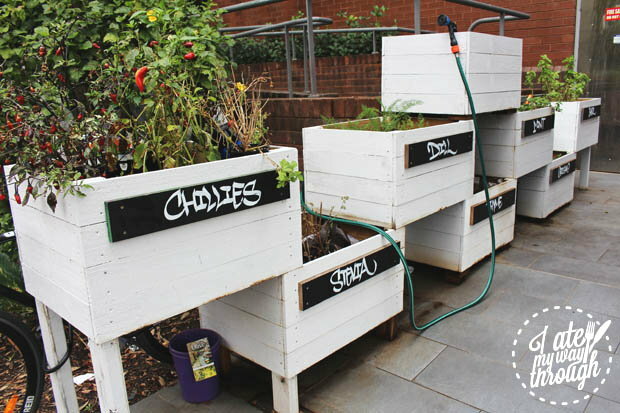 But with so many great places popping up, it can be hard to narrow down your options. 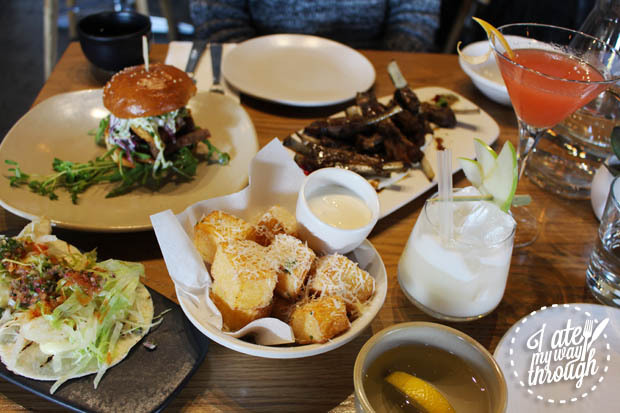 Luckily, the best places distinguish themselves not only with top-notch food, but individual personalities that leave you feeling like you’ve made a new friend in the form of a favourite dining spot. There really does seem to be something for everyone. 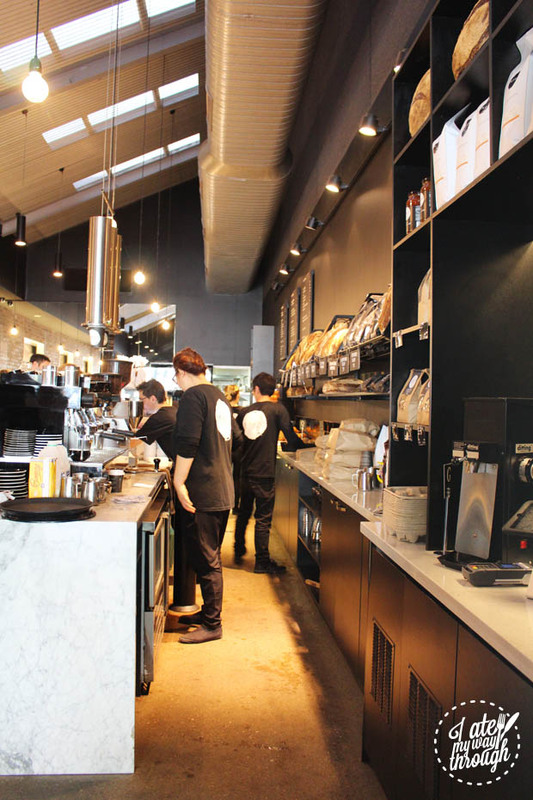 Whether it’s a home-style experience, a funky industrial warehouse vibe, a summery beach house environment or simply a new regular go-to for coffee that you’re looking for, we’ve done the hard work for you. 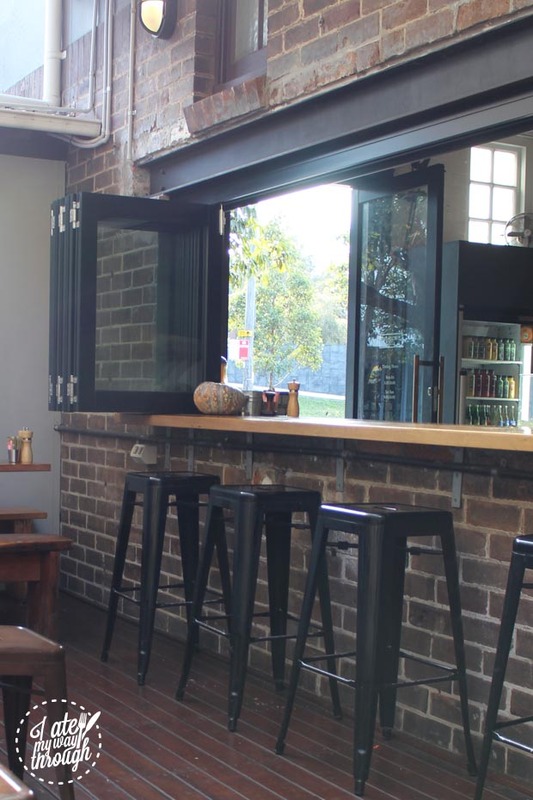 We’ve compiled our list of the best cafes and canteens around Rosebery and Alexandria to spend your breakfast, brunch and lunch. You’re very welcome. A family-friendly atmosphere with homestyle cooking that will make you think of your own cultural roots and happy weekends spent being force-fed by your loving grandparents. 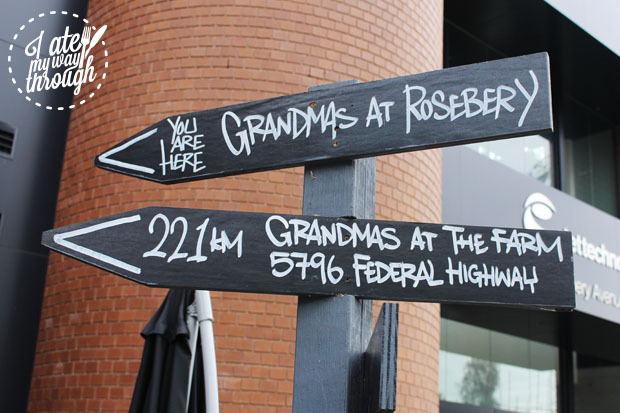 Grandma’s at Rosebery has fast become a favourite place to visit, with a warm and friendly atmosphere and a culturally rich menu. 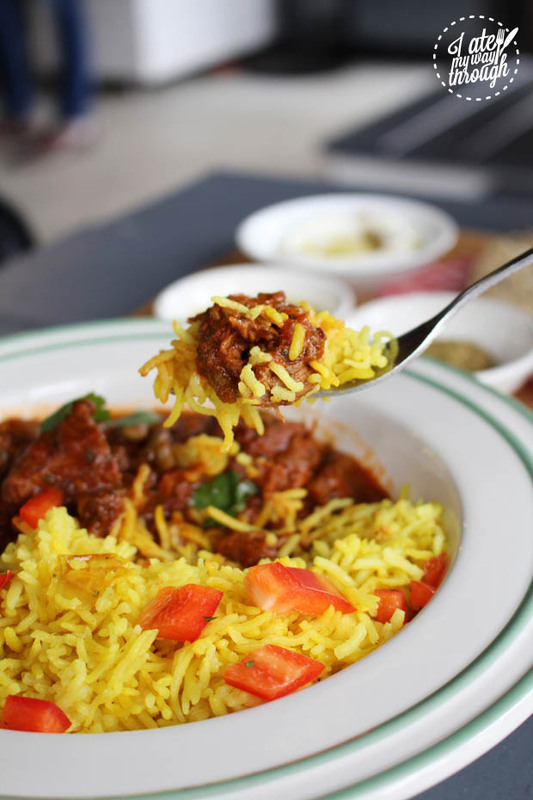 The food at Grandma’s is inspired by the recipes of a number of real grandmas and grandpas, with Mediterranean, North African, Irish, English and Greek influences popping up throughout the menus at Grandma’s three different locations. Such a wide array of flavours line the menu at Grandma’s, and this has only solidified the brand as a trustworthy source for a great brunch! While the philosophy of home-style food and a family-friendly attitude runs strong across each store, Grandma’s has also been tailored to suit each of its environments. Grandma’s at the Farm (Collector, NSW) is particularly suited for long, lazy lunches; Grandma’s Little Bakery at Alexandria welcomes family lunches complete with a children’s play area; and the newest addition, Grandma’s at Rosebery, features a range of on-the-go options to allow workers on their lunch breaks to enjoy the deliciousness of home-style cooking. 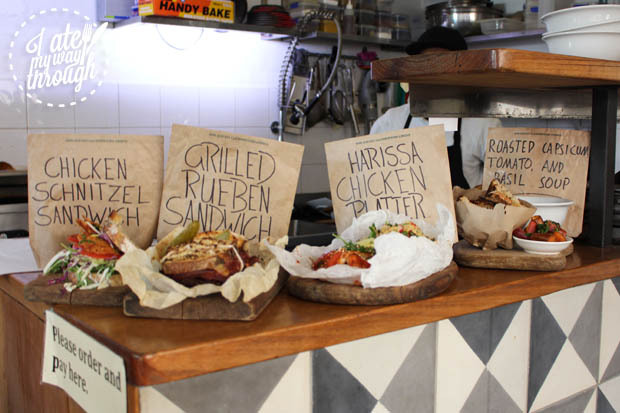 But while the Rosebery store caters for takeaway meals, dining in is where I feel the real magic happens. Adorable outdoor benches and tables create the sense that you’re on a picnic with family and friends. And the mostly white and grey colour palette ensures that the vibrantly coloured food really pops off your plate. It’s enough to make you want to spend the whole day at Grandma’s. 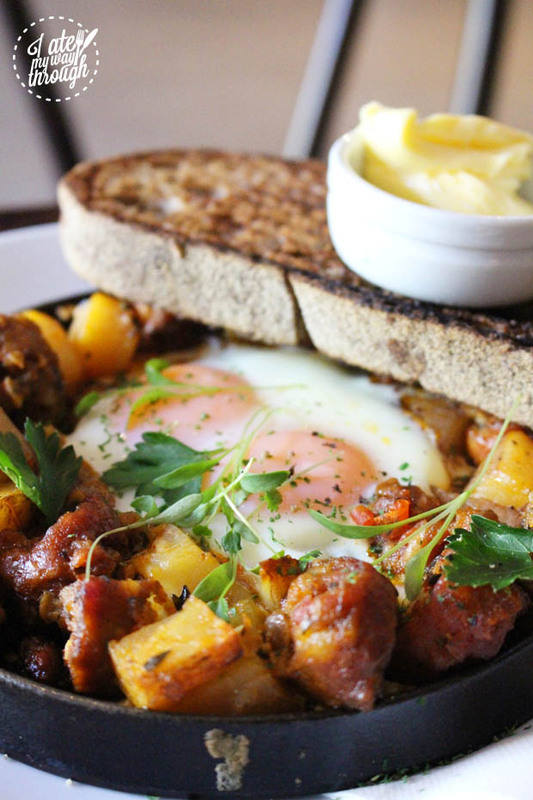 Breakfast is served all day featuring a number of dishes that you’d be silly to miss out on. 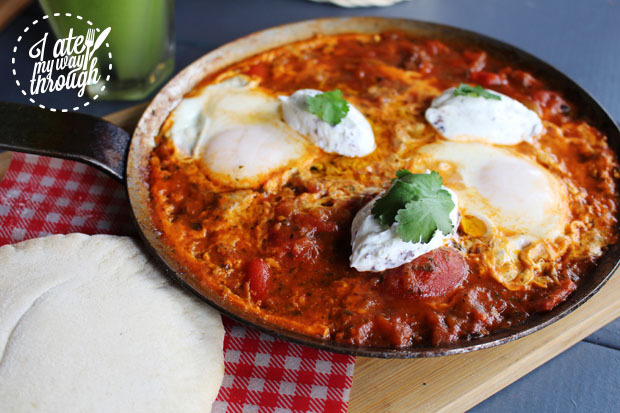 We tried the ever-popular Wood Fired Eggplant and Tomato Shakshuka ($16), which is served freshly cooked in a hot pan and is paired with Labane cheese dressing and fresh pita bread. The shakshuka warmed me completely and was beautifully smoky, while the Labane added a delicious cheesy hit to complement the tomato. I could eat this every morning for the duration of winter and not get sick of it. Another must-eat on the all day breakfast menu is the Ricotta Pancake with Yoghurt ($12). 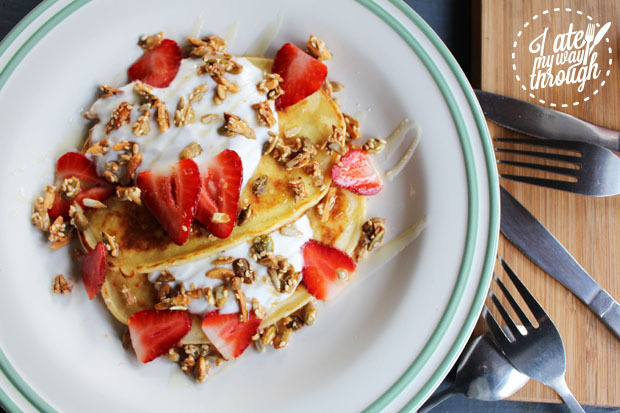 These pancakes are served with fresh strawberries, a nut mixture featured in one of Grandma’s tasty cookies, a honey and orange blossom dressing and yoghurt. We got the additional coconut yoghurt, which made the dish all the more divine. It was sweet but not overly so, leaving us feeling completely guilt-free and happily satisfied. Off the lunch menu, the Mini Beef Casserole ($8.9) served with Grandma’s rice was another hearty dish perfect for winter. The slow-cooked beef was so soft and thoroughly delicious, and reminded me of my own family’s cooking. The casserole is also available as takeaway from Grandma’s Lunch Station, which runs on weekdays. 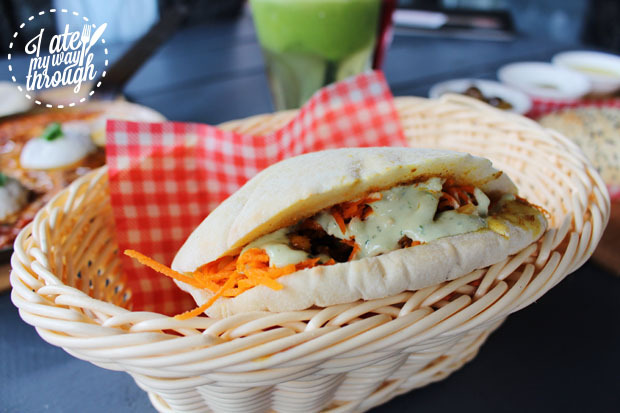 Another takeaway option is the Pita Project, which is handmade to order and features barbeque chicken, ras el hanout, carrot and almond salad and tahini. The pita was packed with flavour and easily beats any takeaway fast food franchise in terms of quick, affordable and tasty – and let’s not forget healthy! – meal options. And as if these dishes aren’t enough to make Grandma’s a surefire favourite, perfectly brewed coffee, healthy juices and delicious sweets to go with your meals only serve to enhance the overall dining experience. Fresh juices like the Seasonal and Fertilizer are proof that healthy juices can taste delicious too. Freshly baked cookies like Grandma’s Coconut Cookies ($8.90) and the Pistachio Butter Cookies ($10.90) (my new fave!) are a wonderful take-home sweet that I couldn’t help but munch on regularly for the rest of the afternoon. 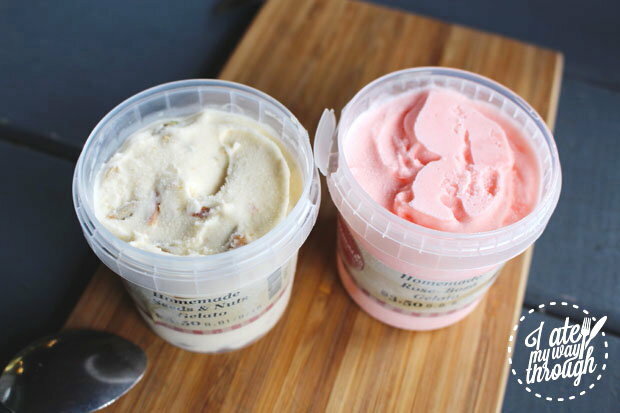 And homemade gelatos in special flavours like the Seeds and Nuts Gelato ($4.50) and the Rose – Bozá Gelato ($3.50) are definitely additions that will have you eagerly anticipating your next visit to Grandma’s. I sure am! A summery, vibrant environment that will have you dreaming of long days spent at the beach. With a breakfast, lunch and dinner menu that encourages you to share your food, it’s definitely a place to catch up with your nearest and dearest. 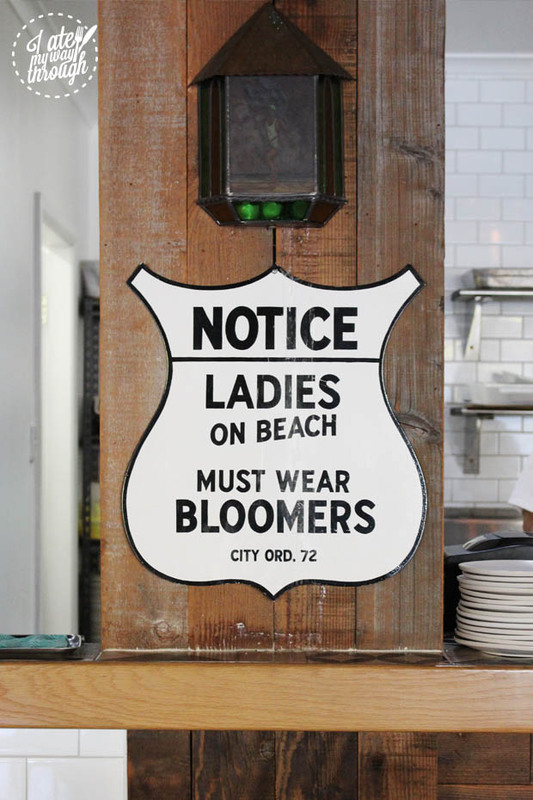 Located beside the national headquarters of Surf Life Saving Australia, Clubhouse Rosebery is a new restaurant inspired by the bright, rich cultural history of the surf life saving club. 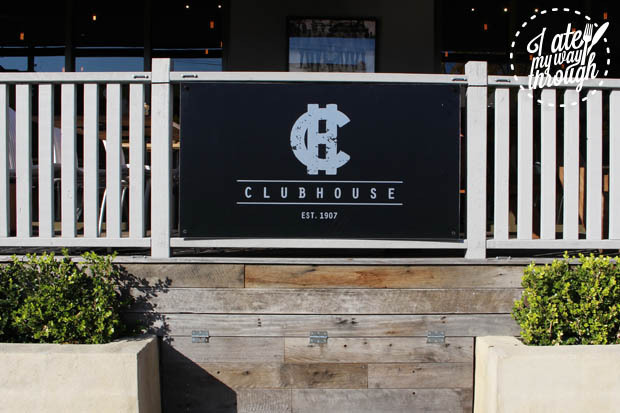 With an open kitchen and dining area, and relaxing lounges outside on the deck, Clubhouse encourages a cheerful, social dining experience – complete with amazing food. The menu is diverse, with a slightly different vibe spread across the breakfast, lunch and dinner menus. While the weekend breakfast menu sports a more café-style menu featuring bircher muesli, croissants, poached eggs and eggs benedict on sourdough, the Wednesday to Sunday lunch and dinner menus offer a range of dishes that are great for sharing amongst friends. We dined here for lunch and were greeted by a menu that appealed to me almost too much. It was difficult to narrow down my choices, but in the end I managed! 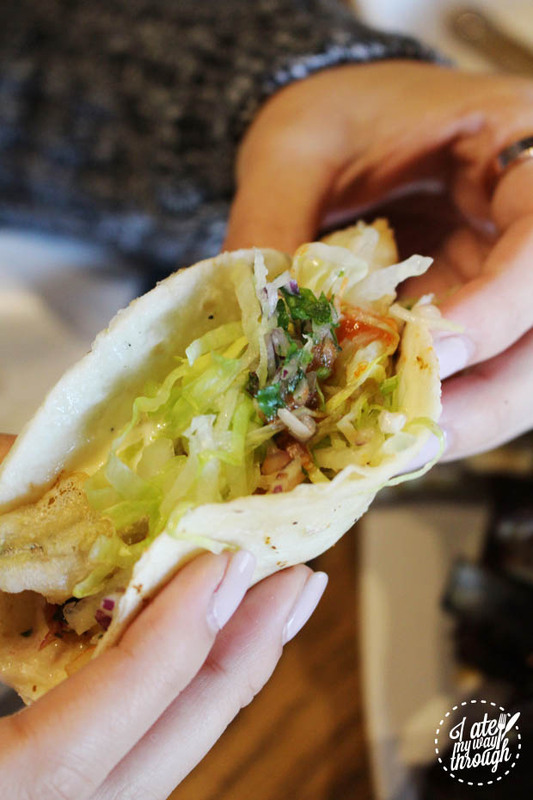 For starters, we tried the Flathead Tacos ($12), served up fried and wrapped in a soft tortilla with coriander and habanero mayo. I’ve grown up with a father who is crazy-obsessed with chilli and all things hot sauce (we have a variety of chillis growing in our backyard and a massive bottle of Tabasco in the fridge) and so I knew the habanero to be one of the hottest chillis out there. 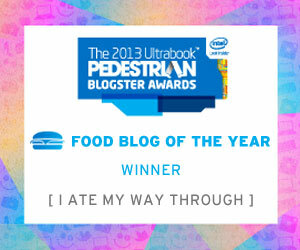 Expectedly, the tacos were quite hot, but not unbearably so. The habanero added a great kick to the tacos without masking the flavour of the flathead, which was well balanced with the whole dish. 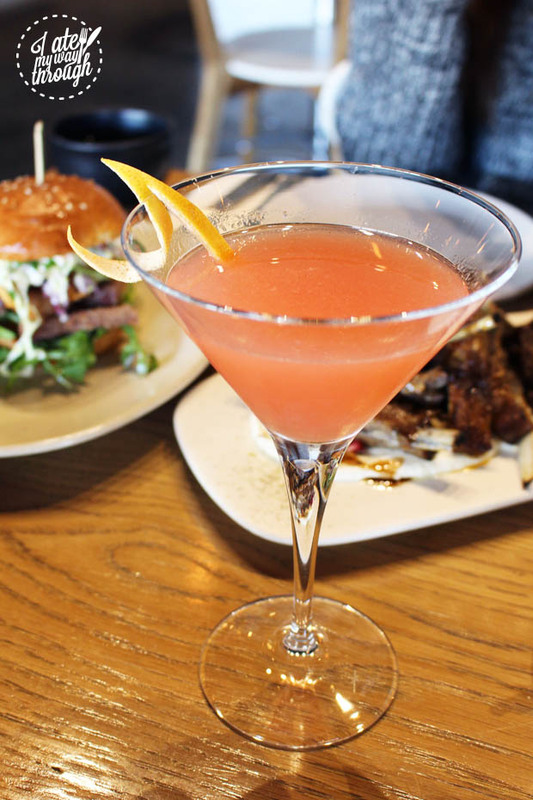 The lunch menu at Clubhouse is offered alongside a drinks menu, from which we chose the adorably named mocktails: Loco for Coco and Grappletini (both $9 each). The Grappletini with grapefruit juice, lemon myrtle tea and elderflower cordial had a strong citrus hit which was really enjoyable. But personally I love coconut cream so I pretty much knew I’d love the Loco for Coco before I even took my first sip. It basically described me. 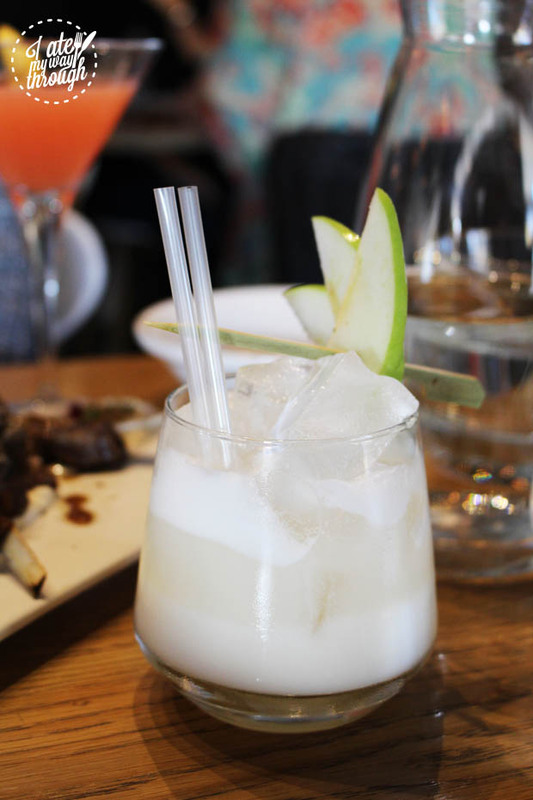 With Coco Lopez crème de coconut, fresh ginger and lime and apple juice, it was an instant hit for me. 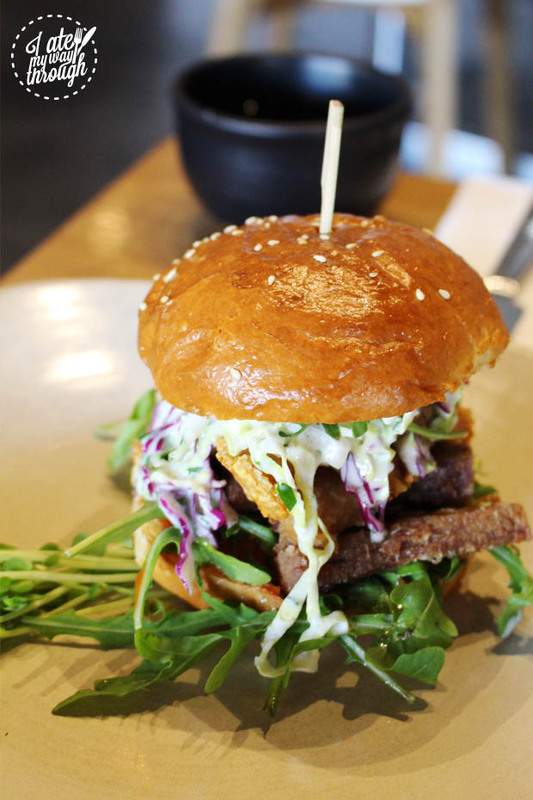 For our mains, we ordered the Pork Belly Burger ($16) with rocket, coleslaw and house bbq sauce in a brioche bun, and the Spiced Lamb Ribs ($24) served with tahini yoghurt, mint, za’atar and pomegranate dressing. The pork belly burger looked almost too good to eat, but I’m glad we actually did eat it because I love rocket and pork belly and the housemade bbq sauce added an amazing flavour to the burger. 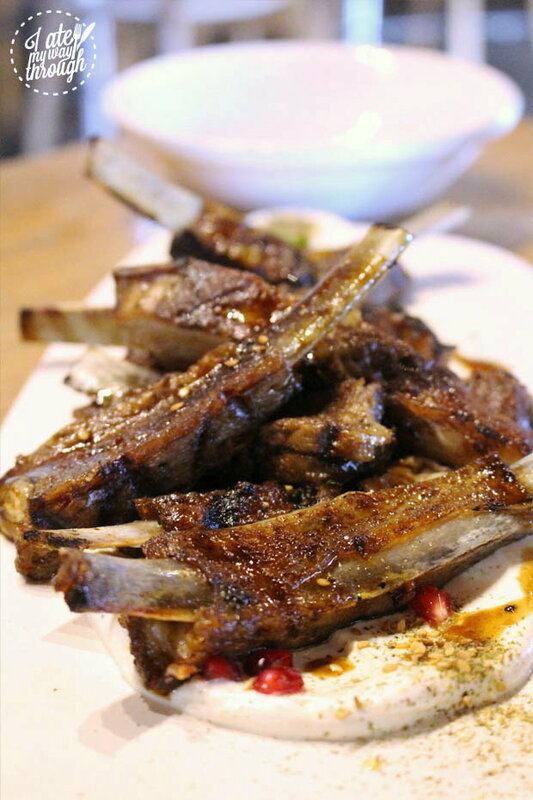 With the lamb ribs, the meat fell right off the bone and the Middle Eastern flavours coming through from the tahini and za’atar made the dish a lot more special than your average serving of lamb ribs. 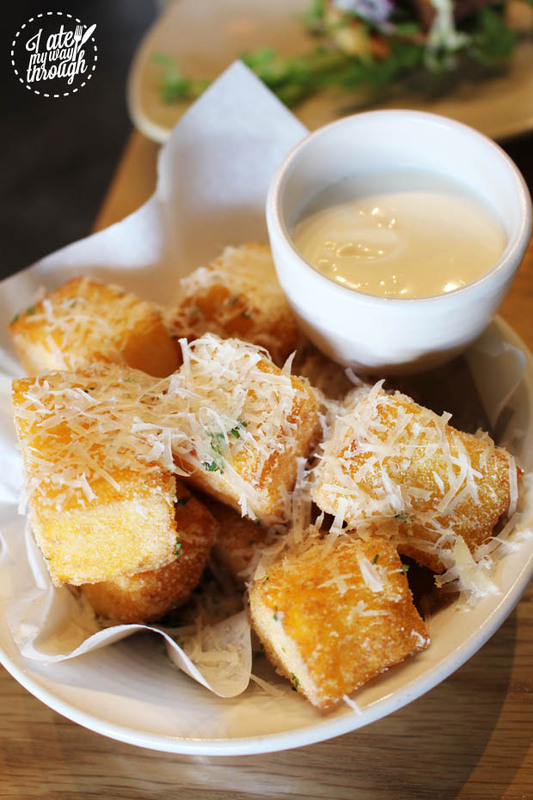 In addition to our mains, we ordered a side of Truffled Polenta Chips with parmesan and aioli ($8). These were divine and very filling. As soon as they were brought to us from the kitchen we were hit by the distinct aroma of truffles. Cut into perfect cubes, the exterior of each chip was crunchy but still delicate, and the polenta inside was soft and warm. For dessert, we had the highly recommended Clubhouse Gaytime ($15) with toffee parfait, honeycomb chunks and a drizzle of caramel sauce. 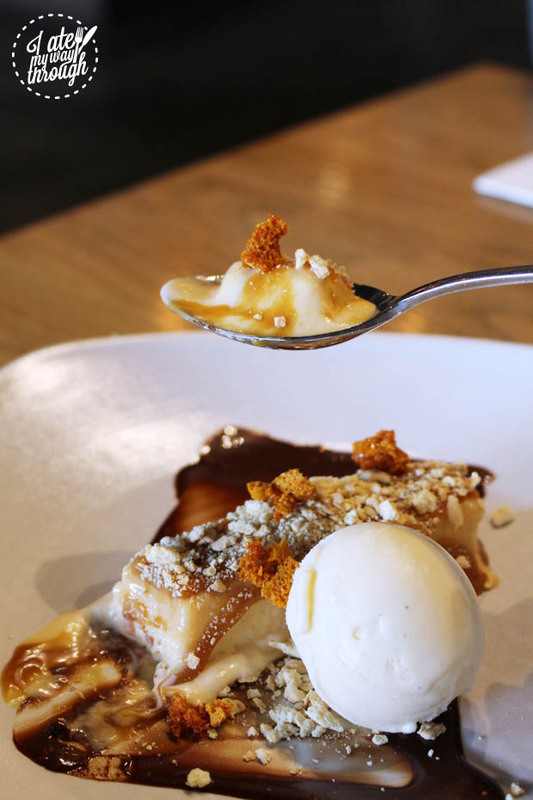 This dessert was a well-balanced combination of super-sweet caramel and creamy parfait that left our stomachs happily full. 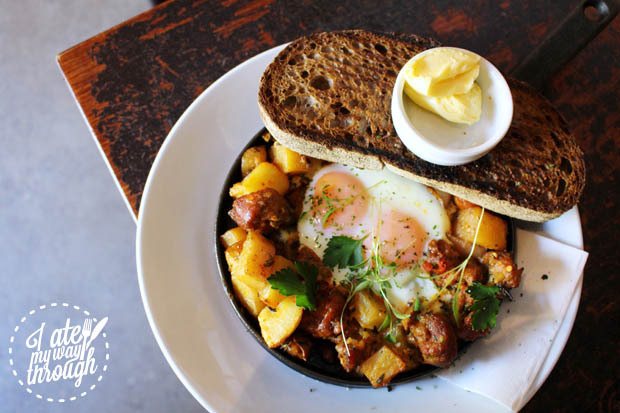 If you’re after a place that has a welcoming, beachhouse atmosphere with the signature dishes of a well-groomed café, then Clubhouse Rosebery’s weekend breakfast menu is definitely for you. If you’re after something a little more fancy then grab a cocktail from the bar when you come in for the lunch (or dinner) menu. Either way, I doubt you’ll be disappointed. An industrial-chic interior with warm lighting provides a place to feel relaxed in. 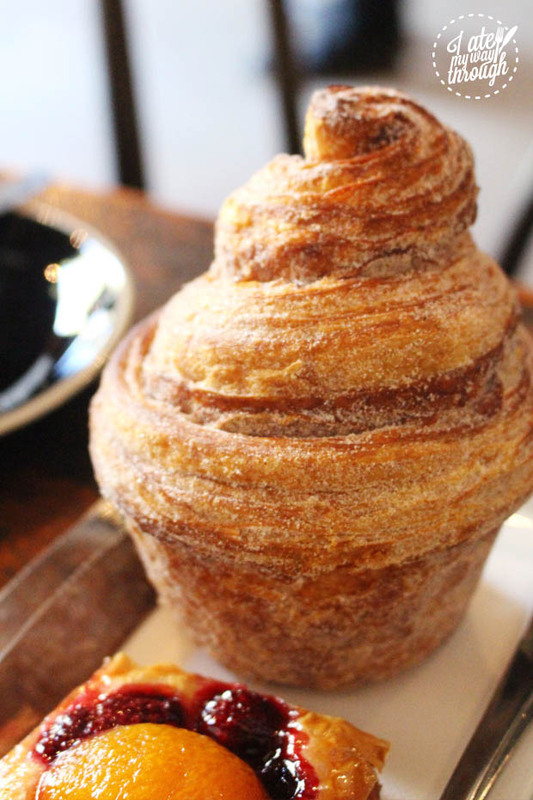 Flawless dishes, flaky pastries and flavourful sourdoughs will have you coming back for more. 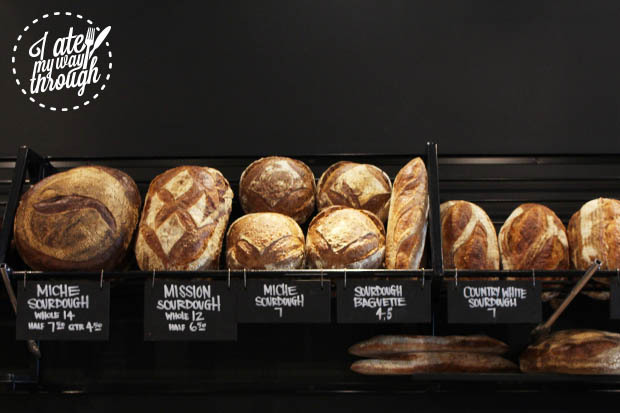 With Sonoma bakeries popping up in six different locations throughout Sydney, there’s very little doubt that these artisan sourdough bakers have become a definite crowd pleaser. 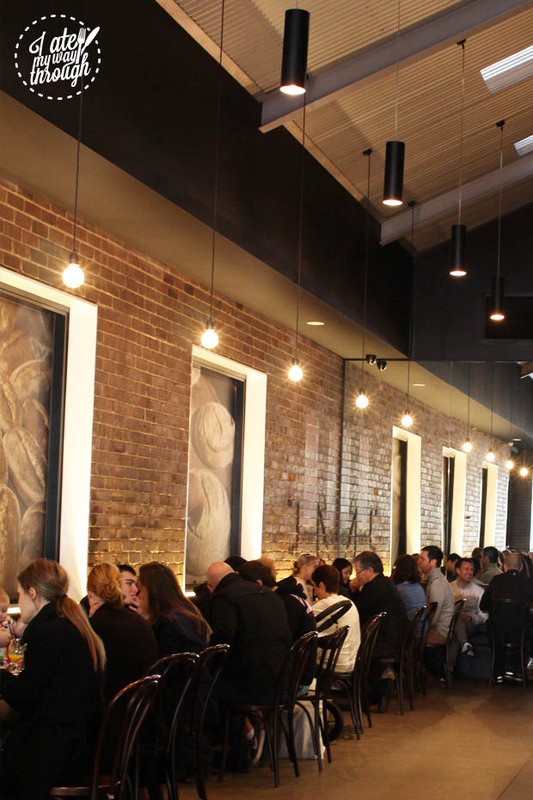 At their Alexandria café, whole-sized loaves of their iconic sourdough breads sit proudly along a high shelf. A wall is adorned with old photographs capturing Sonoma’s rich history and legacy. And a high ceiling, dark interior and brick walls give the place a slightly industrial, very sophisticated feel. The menu features both sweet and savoury meal options, with sourdough rightfully popping up in many of the dishes across the menu. We were treated to one of Sonoma’s specials on the day, the Gluten Free Eggs Benedict with spice-rubbed salmon and asparagus spears ($22). This dish truly was divine. The hollandaise sauce gave it a rich flavour, which served to complement the generous heap of salmon placed atop a thick slice of toast. Not one component of this dish was mediocre, and from my first bite I had already decided that I would order this again in a heartbeat. In addition to this, we tried the Baked Eggs with chorizo, potato and sourdough ($18). When brunching, one must always accept an offering of baked eggs. It’s like a cardinal rule. This take on baked eggs was definitely a winter winner, with the combination of chorizo and potato creating a very warm, comforting dish that suited the cold morning. And with Sonoma’s iconic sourdough served with the baked eggs, flavour was bursting from all directions. Being the sweet tooth that I am, I was more than happy to sample three of Sonoma’s signature pastries. Their take on the classic cinnamon donut, the Morning Bun, was satisfyingly sweet and packed with cinnamon. It had a flaky, light interior, which made it feel practically guilt-free to eat. The Apricot Danish was also a welcome addition to our table, with the flaky savoury pastry and the sweet fruit creating a great overall combination. 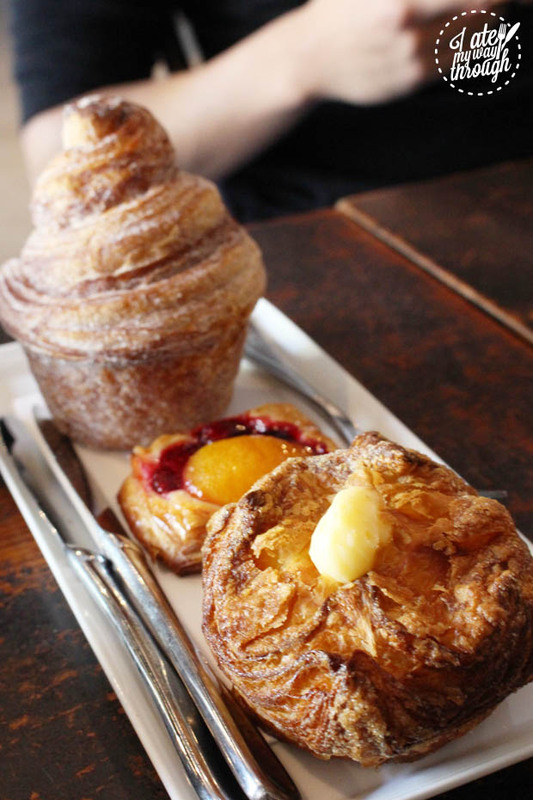 But I don’t think I can rave enough about my favourite of the three pastries, Sonoma’s Kouign Amann with a filling of vanilla crème patisserie. I actually had an extreme sense of regret when I left Sonoma realising that I had forgotten to take some of these home with me for later. Like the other two pastries, the Kouign Amann pastry was beautifully light and flaky, however it was packed with a generous filling of vanilla crème patisserie that was not too sweet at all. While I’ll acknowledge that I probably have a high tolerance for sweet things, this pastry hit the spot without being too indulgent – making it one to be enjoyed by everyone. Having filled my stomach to its full capacity, I absolutely could not eat anymore so I graciously accepted a loaf of Sonoma’s Miche Sourdough to take home. 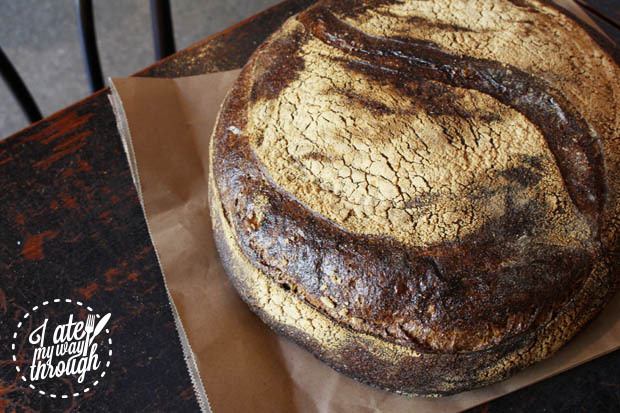 The Miche stands alongside the white Mission sourdough as the two signature Sonoma breads. Baked fresh that morning, it smelled amazing. I was told that the sourdough would only get tastier with age and was encouraged to see how the flavours developed after 2-3 days. This dark bread had a chewy interior and a caramelised crust that gave it a very distinct, rich flavour that I really enjoyed. Having tasted Sonoma’s delicious coffees, their divine dishes, their flaky pastries and their iconic sourdough, it is abundantly clear to me why these cafes have popped up in so many different locations. 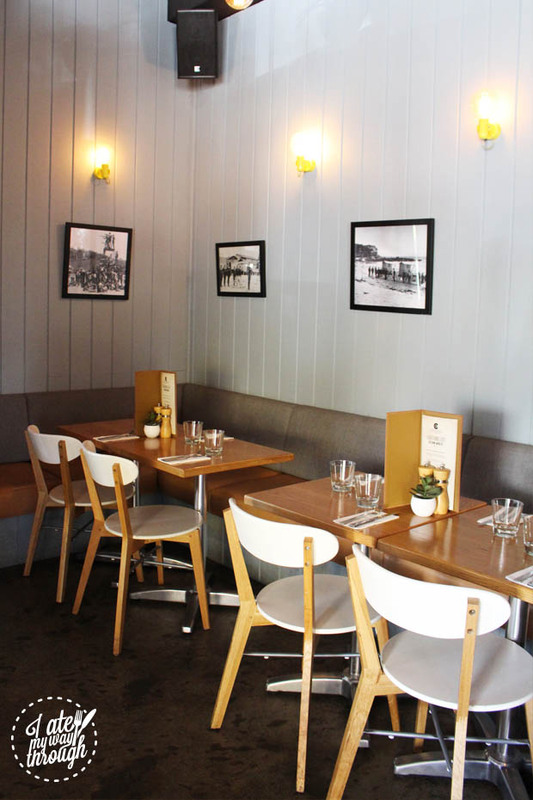 In addition to offering very specially crafted sourdoughs, Sonoma offers a sophisticated, stylish and friendly environment, complete with unforgettable food. 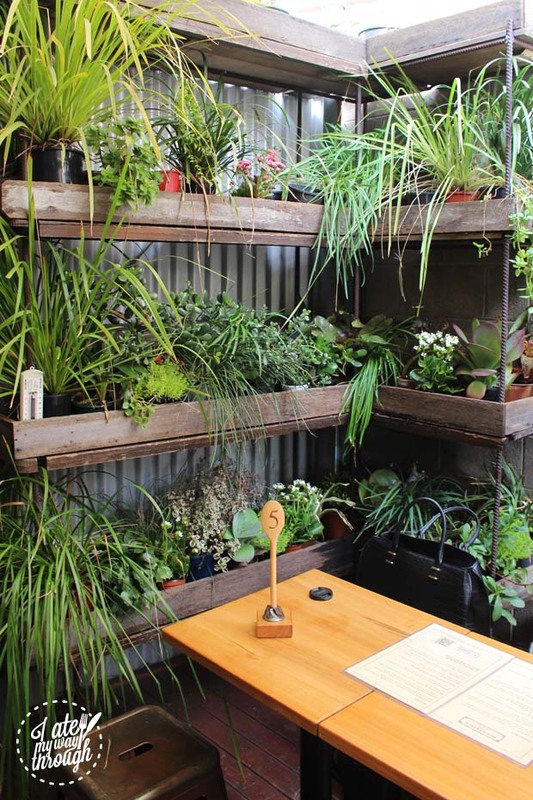 A renovated electrical sub-station offers the perfect spot to spend a sunny day brunching and lunching against the backdrop of a lush vertical garden. With healthy, fresh meal options beautifully displayed for you, you might struggle to pick just one. 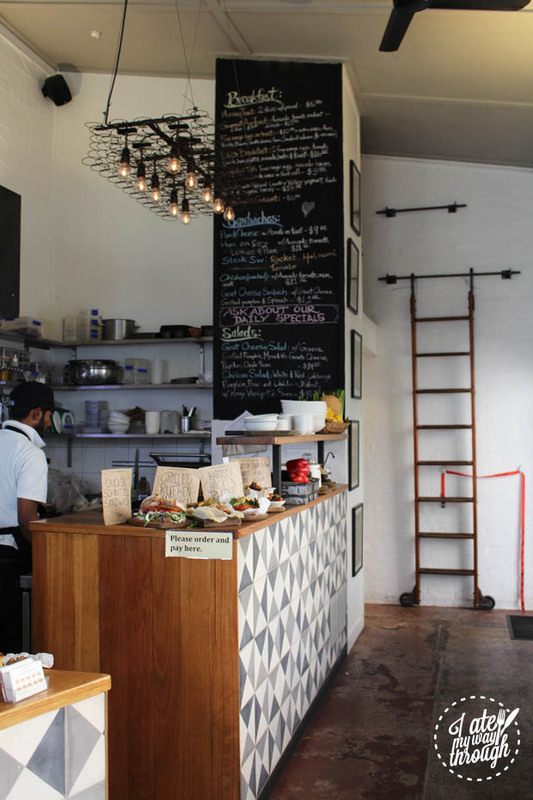 Located on a fairly busy main road in Alexandria, Sub-Station Café does a remarkable thing of transporting you to a quiet, intimate outdoor courtyard that makes you forget the hustle and bustle only metres away. 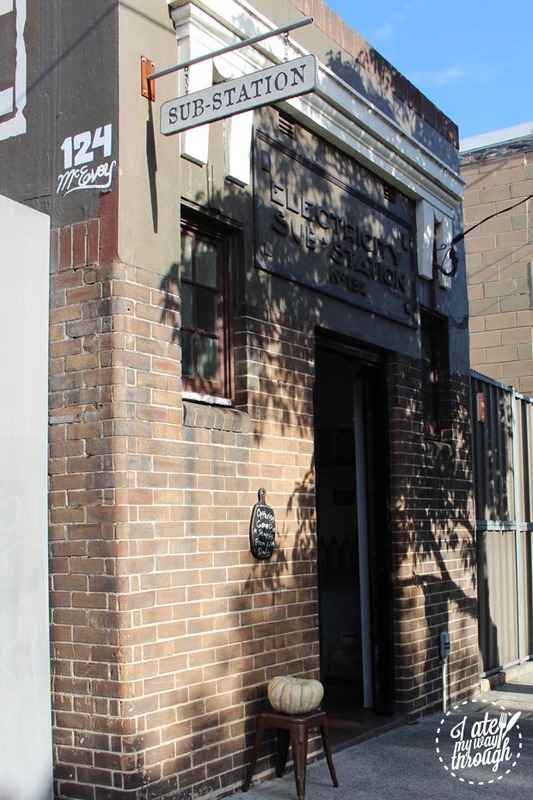 Previously a derelict, abandoned electrical substation, the small building was transformed by its owners into a cosy, welcoming café. An open kitchen, timber finishes, outdoor courtyard seating and a lush vertical garden create an environment where you can just sit and relax while the day passes. 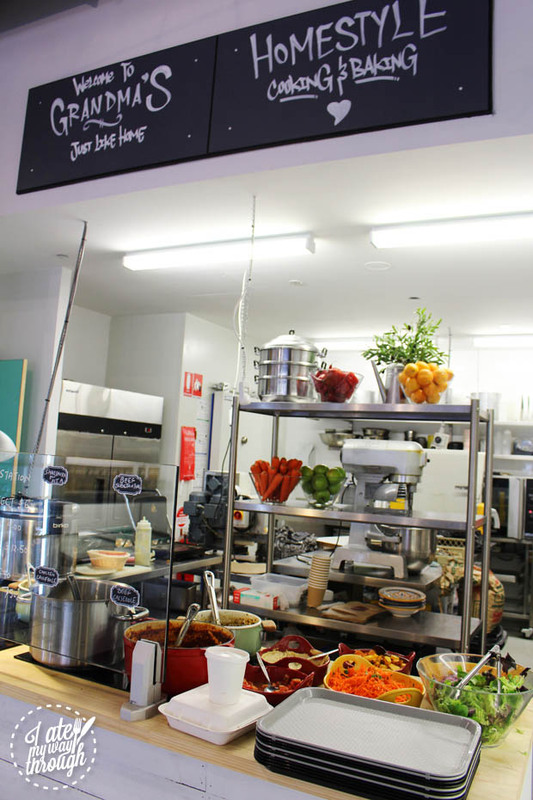 At Sub-Station Café, the menu is constantly changing and adapting – a symbol of chefs who are constantly seeking high quality ingredients and owners who are in tune with customer feedback and favourites. Lunch specials line the counter on weekdays, while brunch specials are more of a focus for weekends. The style of the food here definitely caters to the health-conscious, with a heavy reliance on fresh produce making its way across the menu. 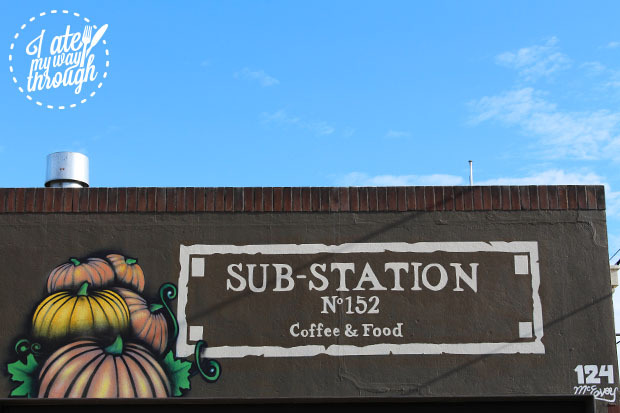 We started our visit with creamy coffees – complete with beautiful swan latte art courtesy of Sub-Station Café’s barista, Kevin – and a Pumpkin Scroll ($5.50). 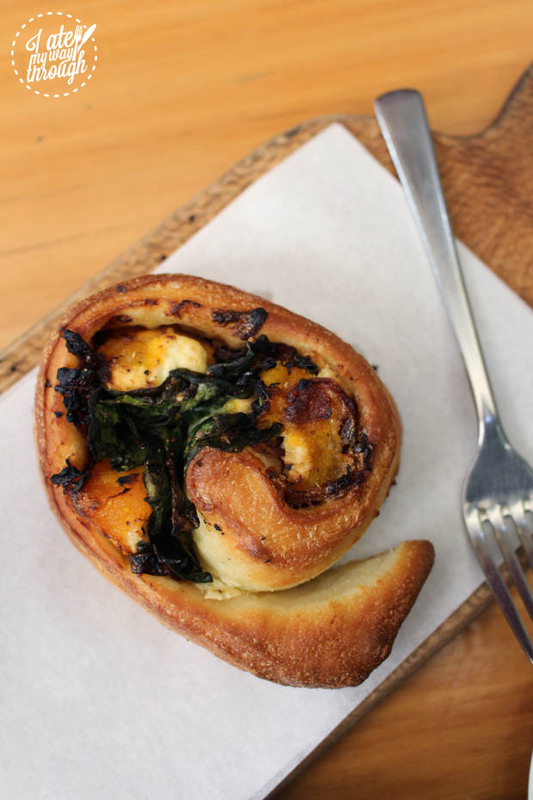 The sweetness of the pumpkin and caramelised onions with the savoury bread and cheese was a great combination, and left me excited to taste everything at this welcoming hole-in-the-wall café. We tried two dishes from the lunch specials menu available on the day. 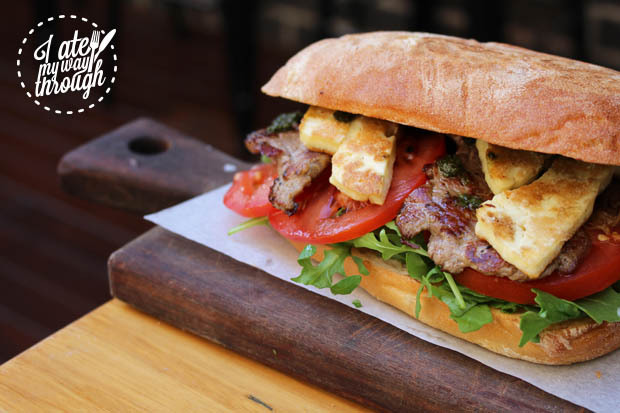 The Steak and Halloumi Sandwich ($14) with rocket and tomato was a tasty meal option, with the halloumi cheese and dollops of pesto working well to complement one another. 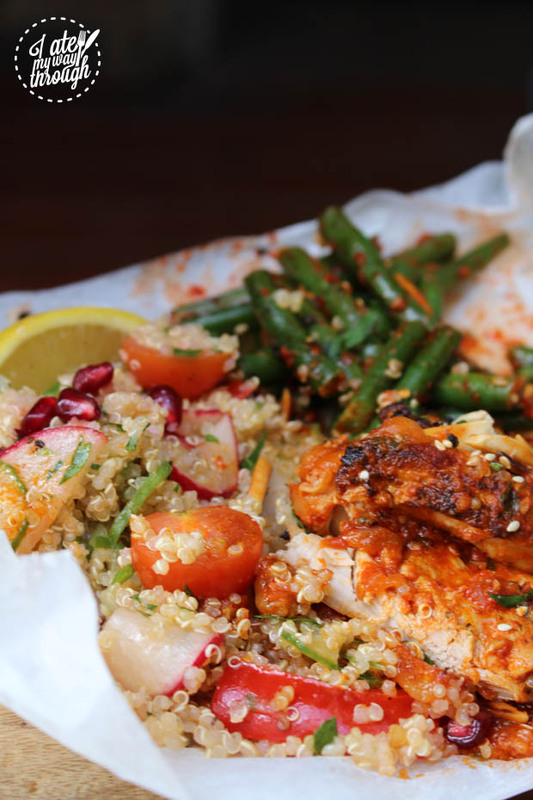 Also a lunch special, the Harissa Chicken Platter ($16) made with a homemade Harissa paprika paste and served with quinoa and bean salads was nothing short of delicious. The chicken itself was soft and had an amazing flavour to it, complete with a bit of a chilli hit. Both accompanying salads tasted fresh and were welcome additions to the meal, with a number of subtle additional ingredients (like the pomegranate in the quinoa salad, yum!) making the dish a definite standout. 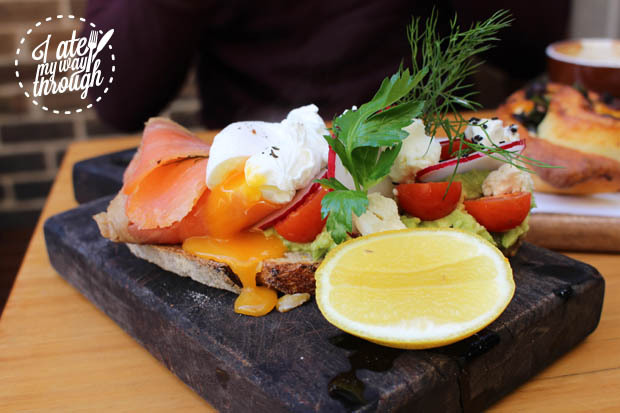 The Smashed Avocado with salmon and poached eggs ($17.50, available as a brunch special) was beautifully plated, with its key ingredients deconstructed in an elegant fashion so that we could clearly see the different components of the dish. The very generous pile of salmon was accompanied by a poached egg, the smashed avocado, goats cheese, sliced radish, a sprinkle of black sesame seeds and a garnish of dill and continental parsley. This was definitely a great, healthy brunch option. 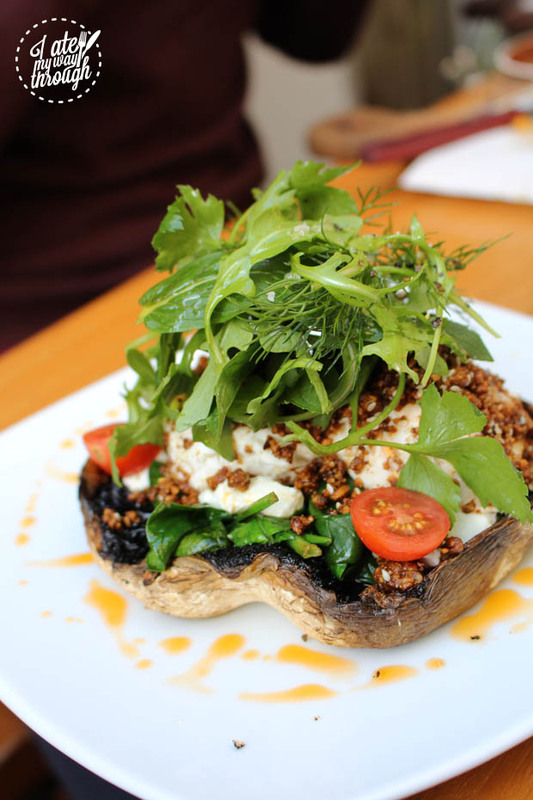 One of my favourites of our visit was the other brunch special, the Dukkah Eggs on a large grilled mushroom with marinated goats cheese ($16.50). The Dukkah mix was pleasantly sweet, with a mixture of cinnamon, pistachio, sesame seeds, roasted almonds and honey blended together and sprinkled onto a large grilled mushroom and poached eggs. Placed atop this was a garnish of fresh greens, including dill, mint, rocket and continental parsley. 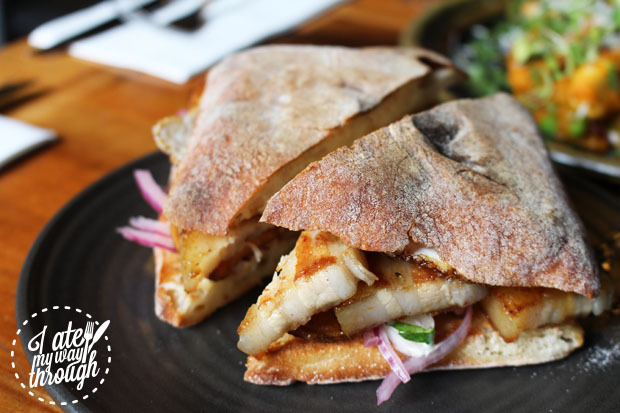 While many other places might go with the cheaper option of including fewer ingredients that might still do a decent job of adding flavour and enhancing the presentation of a dish, there’s no shortness of quality with Sub-Station Café’s dishes. They’ve gone for a range of more expensive fresh ingredients that come together to create delicious, fresh meals that are impossible not to appreciate for their creativity. There have been no shortcuts with these dishes, and that’s what makes them such high quality meals. 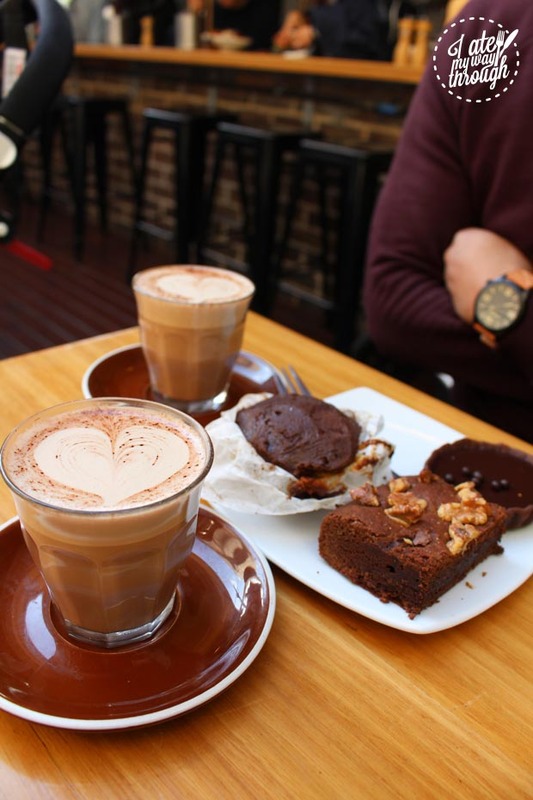 For dessert, we were treated to Sub-Station’s creamy Hot Chocolate and three of their sweets: the Gluten Free Brownie, the Chocolate and Caramel Slice and the Flourless Orange and Almond Muffin (each $5). If you ever happen to have the hot chocolate and the brownie, I recommend you take a bite of the brownie, keep it in your mouth while you take a sip of the hot chocolate and just bask in the chocolatey goodness. For caramel lovers, the slice is a great option – you’ll love watching the caramel just ooze out from under the layer of dark chocolate – and the muffin will be a winner for those who love the combination of fruit and chocolate. 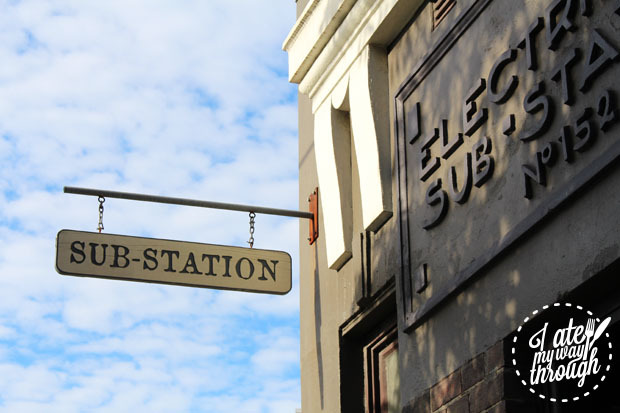 Sub-Station Café offers a great place to visit in Alexandria, whether to grab a quick coffee and takeaway or to dine in the outside courtyard. With either option, you’ll be treated to a scrumptious lunch or brunch complete with fresh, high quality ingredients. 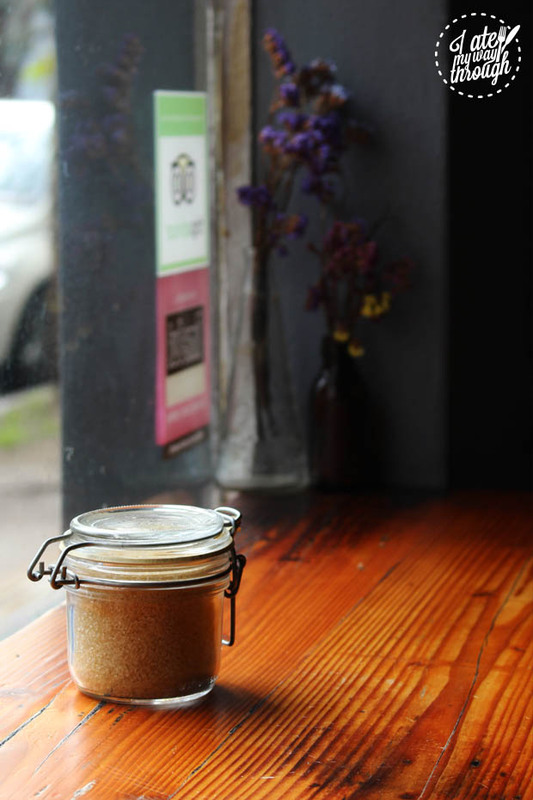 A charming café that celebrates all things brunch and revels in the craft of coffee-making. 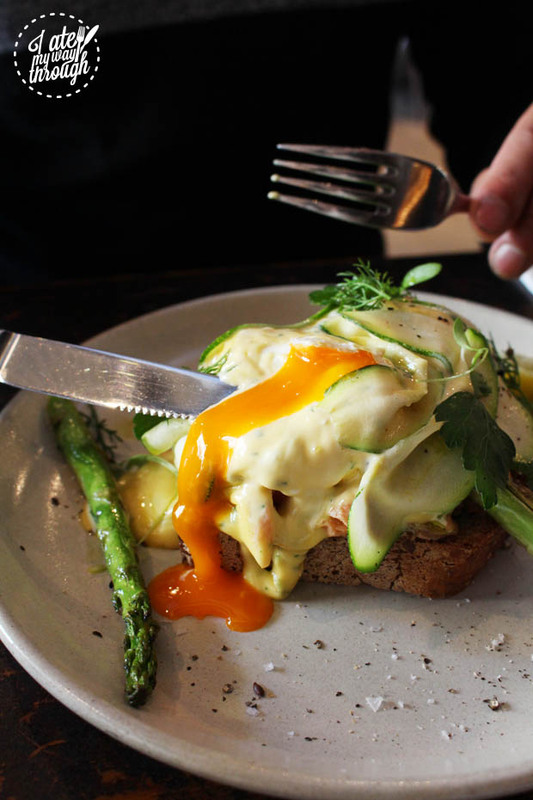 With a unique spin on classic brunch dishes, taking ‘simple’ and transforming it to ‘special’ is the key at this cosy kitchen and coffeehouse. The beauty of The Copper Mill is really showcased in winter. While outside it’s freezing and overcast, inside the café it’s warm, cosy and welcoming, and the open kitchen spreads a wonderful aroma throughout the dining area. This place has rapidly built up a loyal following in the two years it has been open, and a quick browse of the menu makes it clear why. 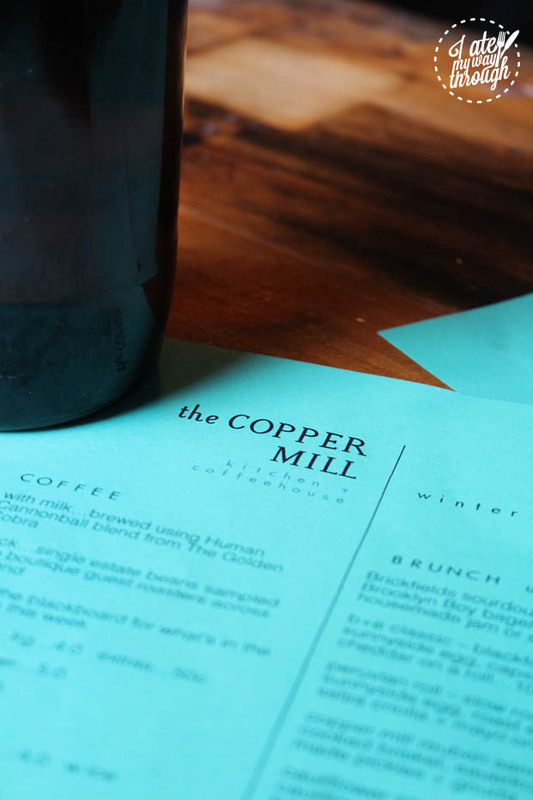 The diverse brunch options are the result of creative brainstorming and innovation, with many dishes taking simple concepts and transforming them into iconic meals at The Copper Mill. To warm ourselves up, we began with the filter coffee, which for the week was the Don Pepe (Washed) Panama by Golden Cobra ($5), and the Coconut Hot Chocolate ($5). The filter coffee had a clear, refined and distinct flavour, courtesy of being brewed gently – definitely a beverage for the coffee aficionados. 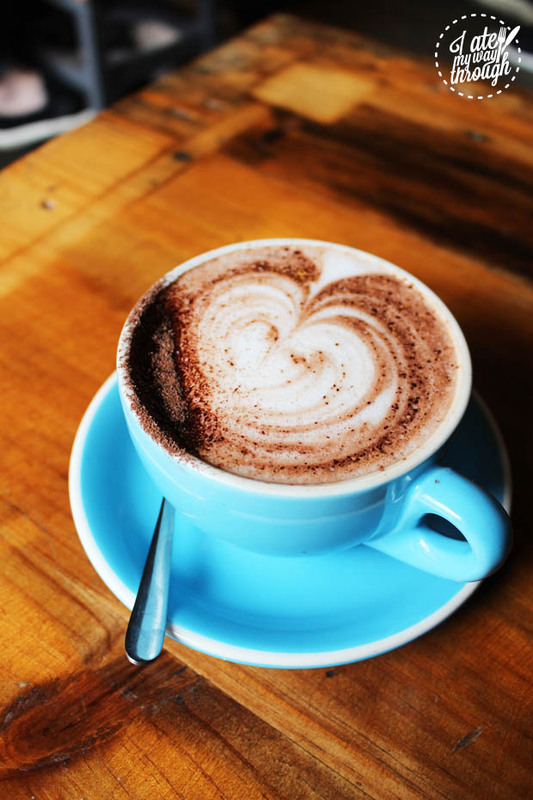 The hot chocolate, mixed with coconut milk, became an immediate favourite of mine, which was probably inevitable given my love of coconut milk, coconut water and coconut cream (basically everything coconut). 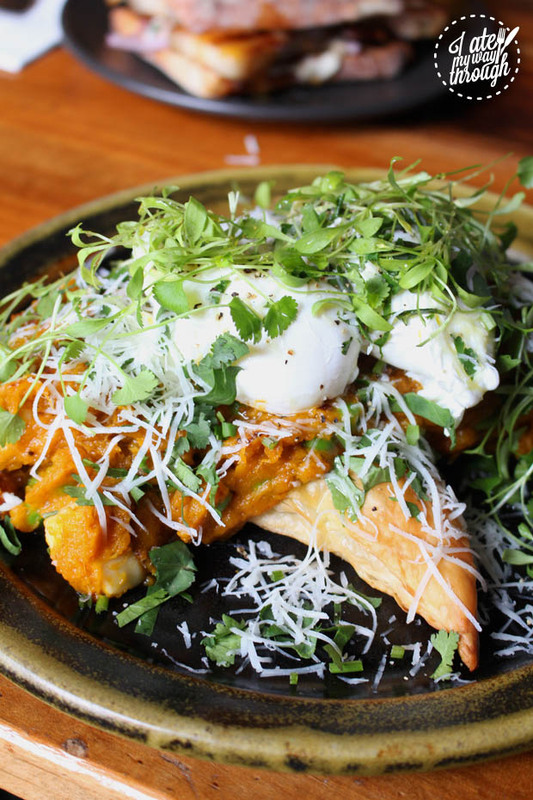 Off the seasonal specials blackboard, we ordered the Puffed Galette ($15), featuring spiced pumpkin locro, halloumi, coriander, garden peas and a poached egg all placed atop a puff pastry base. The first bite of this was absolutely amazing. The pastry was light and the pumpkin was deliciously sweet. Next was the Peruvian Roll ($10), which tends to be a popular choice at The Copper Mill and I can see why. 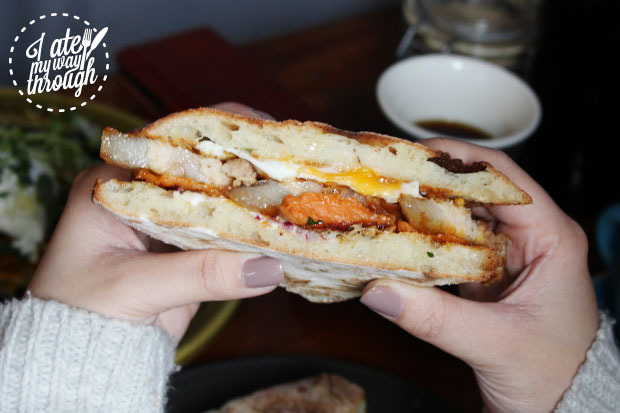 The dish is made up of slow roasted salted pork, a sunnyside egg and roasted sweet potato layered inside a roll with mayonnaise and salsa criolla. The layers of pork fat were unashamedly tasty – definitely making this dish worthwhile for those who aren’t afraid to indulge themselves a little. Further demonstrating their skills at recreating simple meals as far more elaborate dishes, The Copper Mill’s kitchen then served us the Avocado Toast ($12) with sumac roasted tomatoes, fresh herbs, poached egg and dukkah (made with sesame seeds, coriander seeds, hazelnuts and cumin seeds). With a zesty herb flavour bursting from this dish, it definitely was a special take on smashed avocado. Our final brunch dish was a unique take on your typical breakfast of bacon and eggs on toast. 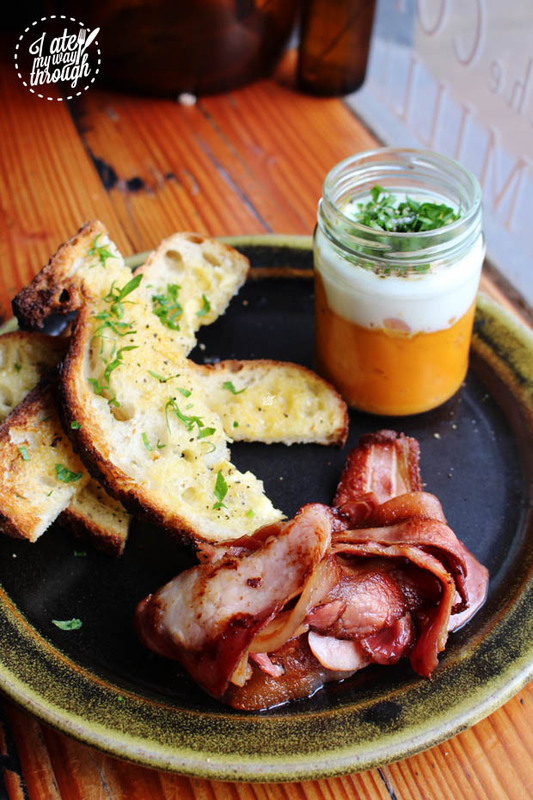 The Coddled Egg ($12.50) featured a little jar of sweet potato puree with an egg broken on top and steamed until cooked, served with bacon and toast. I’d never had eggs this way before but I absolutely loved it. 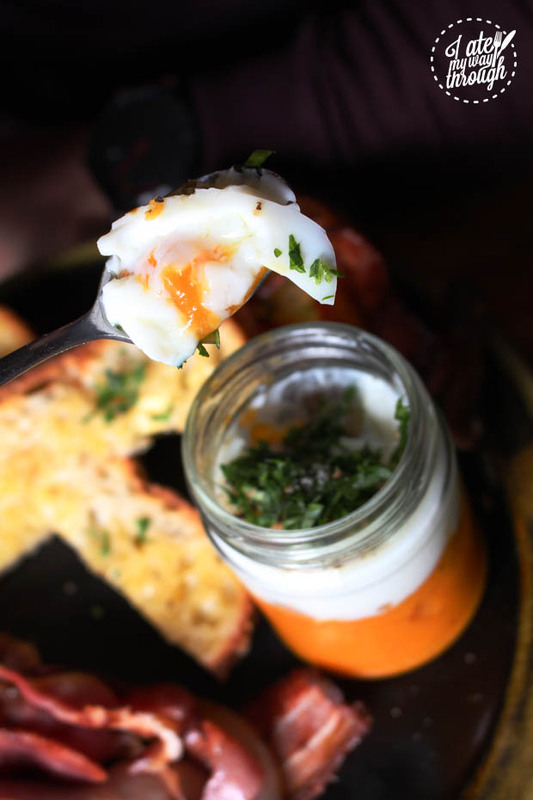 The coddled egg had an almost pudding-like texture, and combined with the sweet potato, it had a wonderful sweetness that made it a complete joy to eat. 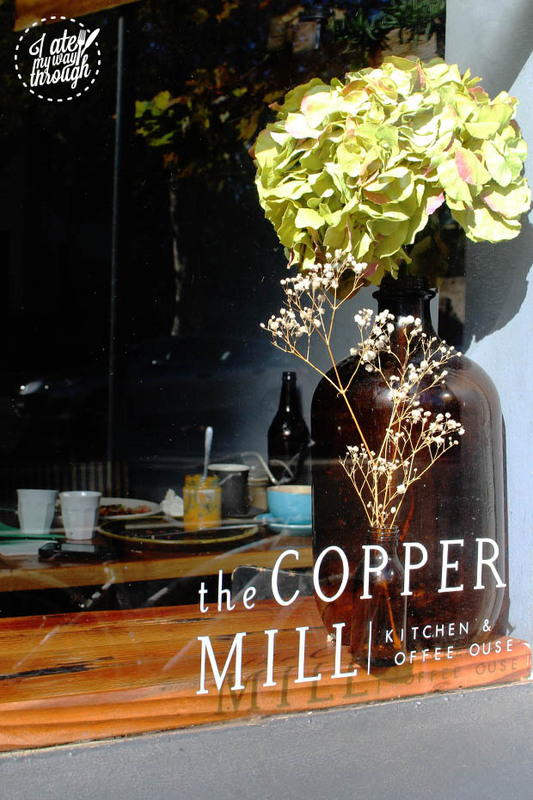 The Copper Mill has thrived through creativity and innovation. 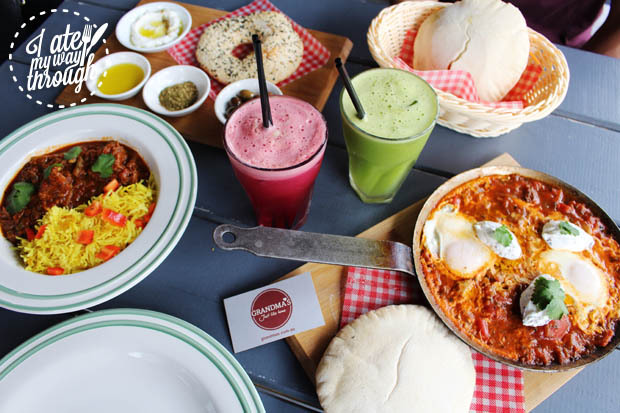 By offering classic brunch dishes with unique twists, this café invites people to enjoy new flavour combinations and cooking techniques in a friendly, warm and cosy environment. This place is a definite must-visit for winter, but you don’t need to be a genius to see that the cooking here deserves to be enjoyed all year round. 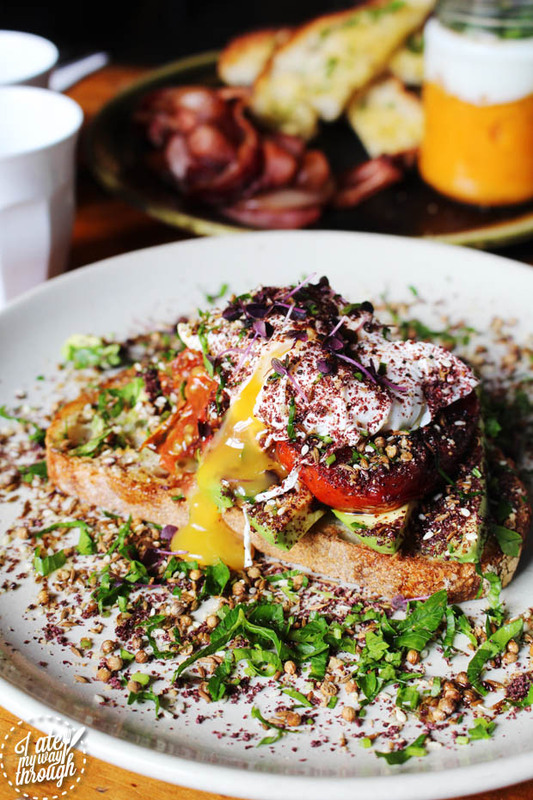 With a vibrant breakfast menu featuring biodynamic eggs, sourdough toast and breakfast bowls packed with fruit and yoghurt, you’re spoiled for choice at Bread & Circus. And the greatness only continues if you stop by for lunch. 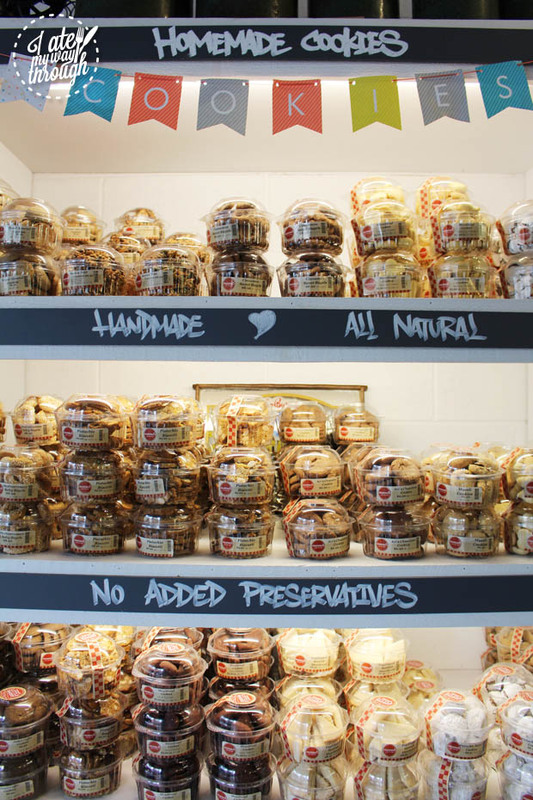 Soups, salads and sandwiches are the stars here, and with the dishes being proudly preservative-free and produced with a biodynamic approach to farming, you can rest assured that what you’re chowing down is good for you too! Pastel pink plates, timber finishes and fresh produce are the core decorative features here, making it a bright and welcoming place to dine in and enjoy a great brunch. John Smith Cafe not only has your brunch covered, but it also has the goods to satisfy your sweet tooth cravings. Brunch menu options include eggs benedict, poached eggs and brioche, with special ingredients like braised pulled pork and beetroot hummus popping up across the menu as well. A collection of desserts are also available daily, with coconut and lime cakes, salted caramel cronuts and red velvet donuts being known to make regular appearances.